Symptoms of food sensitivities and allergies vary widely and can include obvious symptoms such as skin issues or GI distress (bloating, cramping, constipation, or diarrhea). Conversely they can also come in the form of brain fog, migraines, fatigue, muscles aches or joint pain, insomnia, or depression. Depending on symptoms and history-there are many different assessments we can do to determine if it is a food allergy or sensitivity and the severity of it. Food sensitivities are usually part of something larger happening in the body- but removing that food for a period of time while maintaining a gut healing protocol eventually leads the client back to being able to safely (and slowly) reintroducing those foods back into the diet. Other times, such as with wheat or gluten, it may be advised that the food is removed for a longer period. An elimination diet can be effective in detecting which foods may be causing the issues- IF they are the top offenders, such as wheat, dairy, soy, corn, etc. 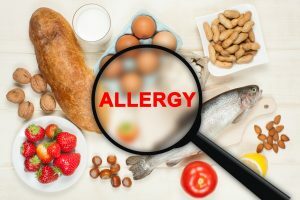 However sometimes it is more complicated and further testing is needed to know exactly which foods, molds, spices or environmental allergens are causing the distress. Depending on how damaged the lining of the intestines is or how severe the symptoms determines which supplements may be suggested. Usually we employ soothing herbals for immediate relief.